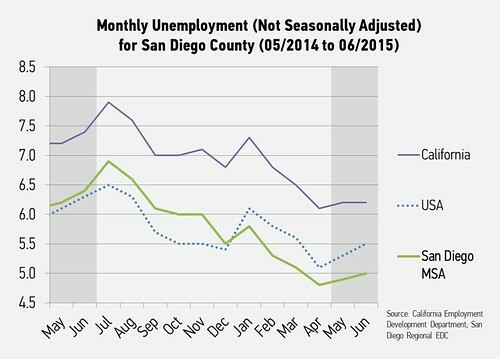 The California Employment Development Department (EDD) released statewide county employment data today for the June 2015 period. This month’s data shows that while unemployment climbed slightly in June, the labor force grew and the economy continued growth at a steady rate. The unemployment rate climbed back to five percent for the first time since March. At 5.0 percent, the rate is 1.4 points lower than the previous year and 0.1 points higher than the previous month. The California average rate remained steady at 6.2 percent, while the U.S. average rate climbed to 5.5 percent, meaning San Diego remained much lower than the state and national averages. The unemployment rate climbed in part due to a rising labor force. This trend is typical in the region, as both public and private seasonal education workers tend to lose work in the summer months. Education accounted for 3,000 lost jobs from May to June, but the sector has grown nearly three percent since June of last year. While a seasonal up-tick in unemployment is common during this period, the 0.1 point change was a much lower change than in previous years. 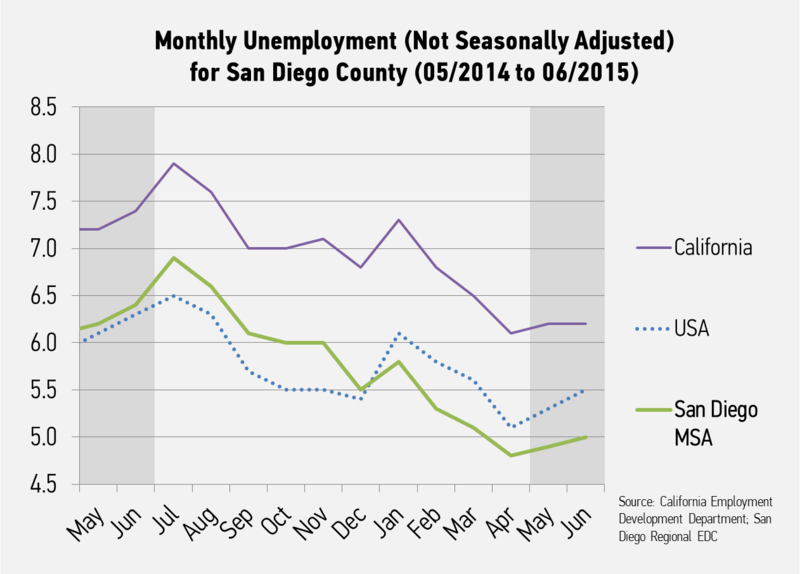 The unemployment rate climbed 0.3 points in 2014 and 0.5 points in 2013 during this same period. From a year-to-year or non-seasonal perspective, the region’s economy continued to grow around 3.0 percent, adding 38,500 jobs from June 2014 to June 2015. The year-to-year growth rate has been consistently above the 2014 annual average of 2.2 percent. So far in 2015, that annual average is at 3.0 percent through June, compared to the U.S. average of only 2.2 percent. The private sector economy again accounted for more than 90 percent of the year-to-year job growth and grew by 3.2 percent. This rate also outpaced the U.S. growth rate, which was 2.6 percent over that same period. This job growth continued to be fueled by key sectors. Construction grew by 5.7 percent and added 3,600 jobs. One of the region’s key manufacturing sectors, ship and boat building, grew by 18.0 percent and added 1,100 jobs. 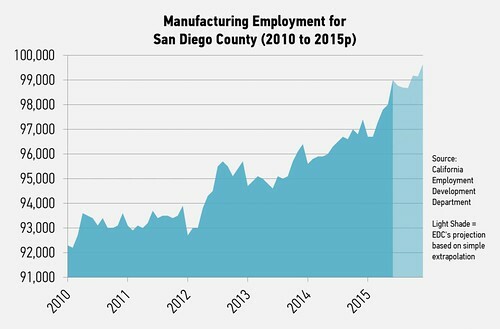 We’ve continued to discuss the stagnant growth in overall manufacturing employment in these reports, but June showed promise for the region’s manufacturing industry. 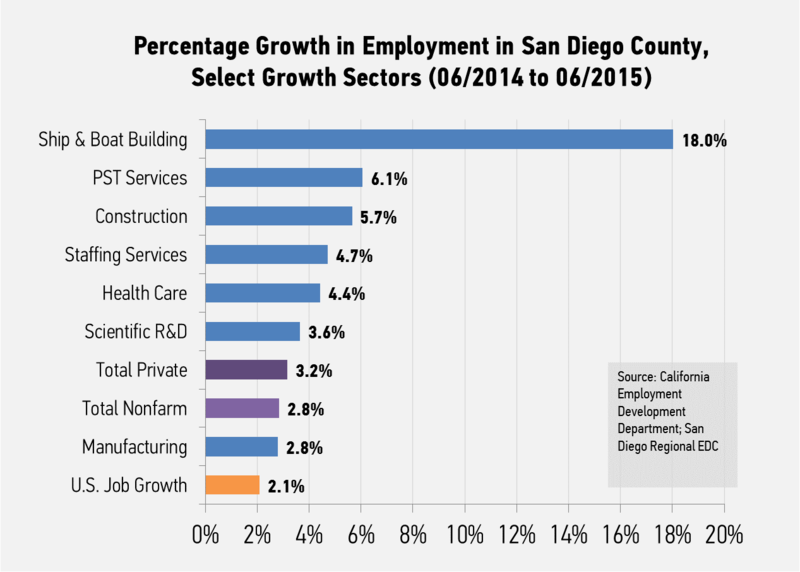 From June 2014 to June 2015, the industry added 2,700 jobs or 2.8 percent growth. This is the highest annual growth rate for the industry that we have on record, going back to 2001. Innovation service sectors have continued to show high job growth through 2015. The professional, scientific and technical services (PST) sector grew by 6.0 percent year-to-year, and accounted for 22.1 percent of all annual private job growth—the most of any sector in the region. This sector represents many of our innovation employers. Scientific research and development services, a subsector of PST that represents many cleantech and life science companies, showed slower growth this month compared to previous months this year. Other key drivers for growth included the region’s health care sector, which added 6,900 jobs and accounted for approximately one-fifth of the region’s private job growth. 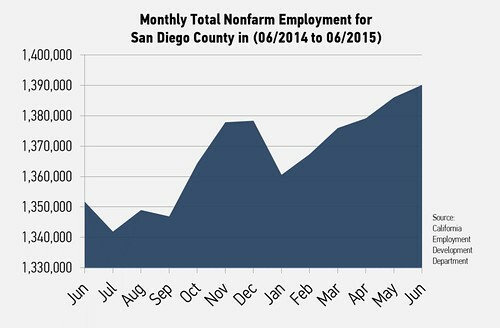 Employment services or staffing in the region grew by 1,300 jobs and has been steadily increasing all year. Finally, while the tourism industry had a slower month than usual, it still accounted for 14.7 percent of the region’s private growth. While the headlines this month will show a climb in the unemployment rate, the story behind that figure is a positive one. A climb in unemployment from May to June is typical, but the fact that the climb was so slight was atypical and a good sign. The labor force continued to grow above one percent annually after years of steady decline. Finally, manufacturing industry employment is showing solid growth after years of slow growth or decline.